A Slice of Lemon Cake. I would imagine that many stores throughout the world are currently low on lemons. Why? You ask. Well, between TWD and Cake Slice Bakers there has been a run on lemons. I alone have used 8 in the last two weeks. Two Dorie Lemon recipes and now a lemon Cake Slice Bakers. Believe me. I am not complaining. I love lemons. They remind me of summer and picnics and lemonade and….well, everything lemony. I missed the last Cake Slice, so I knew I couldn’t miss this months choice. The Cake Slice Bakers are a new baking group on the net. We are using “Sky High”. 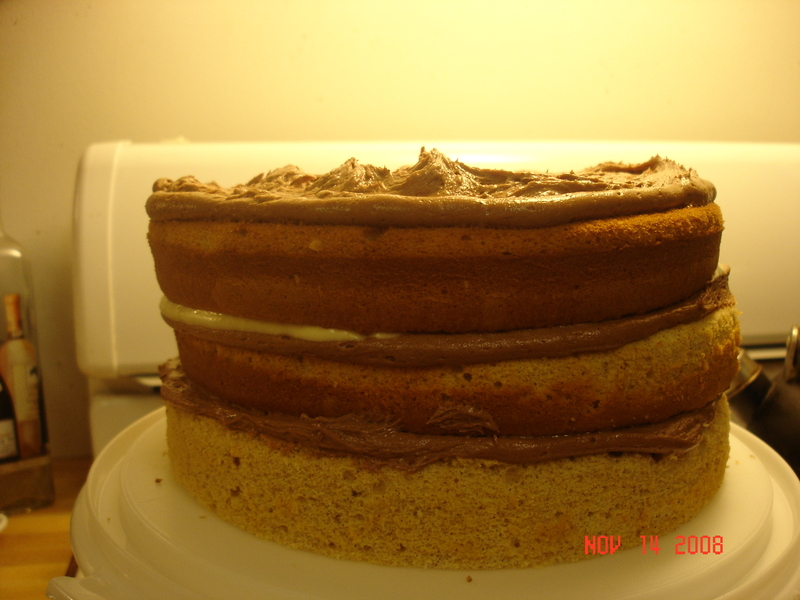 It is full of triple layer cakes, all of which look luscious. The cake was Triple Lemon Chiffon Cake and it was really light and lemony and tasty. I followed the recipe exactly except in the cake and in the frosting I used Splenda instead of sugar. I also only made half of the recipe using my little Wilton cake pans from Session 2. They make a smaller cake and were perfect. Unfortunately the layers didn’t rise as much as I would have liked. So I sliced each layer in half and then cut them in half after I spread on the Lemon Curd. That made a nice little Sky High cake with 8 layers sandwiched between nice layers of lemon curd And then frosted with a Lemon Cream Frosting. Perfection on a plate. I did have some problem with folding the meringue into the paste formed from the flour egg mixture. When it baked there were little tiny clumps of paste that didn’t mix in well. So the cake was lumpy. I don’t know how to cure that problem. But it still had a great lemon taste with all the components put together. Check out how the other Bakers created their cakes. I know they will be beautiful since there are so many creative bakers in the group. Today is Tuesday. January 20, 2009. It is a milestone day for many reasons. A new President. My last ever January 20th to teach. And, let’s see, what else. Oh! Yeah! It is Cake Slice Bakers‘ Day. I had a choice between doing Cake Slice or TWD and this time Cake Slice Won. Sorry, TWDers. Next Week. Anyway, the pick for this month was Banana Cake with Praline Filling and White Chocolate Ganache. . The cake turned out to be quite nice. I am sure there was a great deal of imagination with this one as there was no pic in the book to compare to. Bananas, pecans, white chocolate, whipped cream, cinnamon. How can one possibly go wrong with those? Three layers of yum. But, I have to tell you, I have never worked so hard or used so many pots and pans to make a frosting. (Not that it wasn’t worth every minute, but DANG!!) I liked the flavor. I loved the frosting. I didn’t love the cleaning up afterwards. All those pots/pans and those didn’t include what I used to make the cake. (Which I overbaked because I was multi-tasking –packing for a trip, baking, washing clothes for a trip….). Hubs liked it even tho’ it was dry. The Hunk thought it was okay, but by the time he got a piece, it was 5 days old. 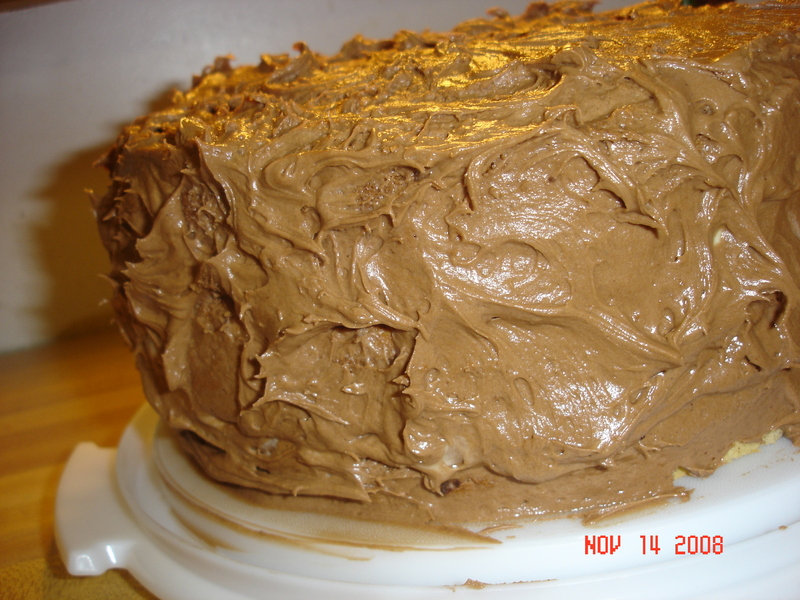 The only reason I wouldn’t rush to make this again is because of the frosting. Or maybe I would JUST make the frosting and eat it alone. **SIGH** I wonder how it would be with a little Creme de Banana Liqueur added…… Next Time. BTW – if you want the recipe, go visit Moogie and Pap. Their cake is adorable. AS if I don’t have enough to do in my life – family, school, etc. – I joined yet another on-line ‘baking club.’ I couldn’t help my self. I already had the cake book, they had just started, and it looked like fun. So which one is it – The Cake Slice Bakers. We are baking from Sky High: Irresistable Triple Layer Cakes. So many cakes, so little time. But I did make time for this one. We had a family reunion this weekend and this cake was perfect.
. Now, I have to tell you, I looked really hard at this cake, and in the book this cake looks orange. My frosting isn’t orange. Was yours orange? I read and re-read the recipe and could not figure out why the book’s cake was orange. My frosting is CHOCOLATE. And it looks like chocolate. That’s okay with me. The rest of the cake came out like I thought it would. It is basically a spice cake made with Sweet Potato. Lots of cinnamon, nutmeg, cloves, and I added just a touch more. The filling was orange flavored. It added a new twist to the cake. I didn’t change the orange filling so, otherwise it was just as the recipe said. The texture was great. I did have a little problem with the cake. I had only made one other cake from scratch using Cake Flour and it didn’t rise – at all. This one just cake out a little lop-sided. I just could not get it to straighten up. When I put the top layer on it started to slide. Put it in the fridge hoping the filling would stiffen. It did, but as I was frosting it the slide continued. All I could do was hope for the best. Fortunately, it made it to the reunion in one piece and it was a hit. This goes into my, “Let’s make it again.” list. If you want to see how the other cakes turned out to The Cake Slice Bakers. One of them will have the recipe posted if you want to try it. It iiiiisssss good!! !